Do you want to make an online portfolio to impress your potential clients? An ideal portfolio presents your work in a beautiful, professional way. Using WordPress, you can put your portfolio online on your website to get more business and boost your revenue. In this article, we’ll show you how to easily make an online portfolio with WordPress. Why Should You Make an Online Portfolio? An online portfolio brings many opportunities on board. When presented well, your work’s quality will truly shine which will impress your site’s visitors, and they’ll become your ambassadors. If you have a business website, you most likely share the services you offer. You should also display your portfolio to show your potential clients your previous accomplishments. A portfolio is visual proof you can perform the services you’re offering. When someone asks you about your portfolio, you won’t need to send it to them by mail or fax. You can simply share the link to your portfolio page. An online portfolio page improves your website’s search engine rankings. Your online portfolio will not only help get you more business, it also connects you with like-minded people who’re looking to expand their businesses in the same direction. However, you’ll need to make sure your portfolio looks professional and interesting to reap these benefits. What Does a Good Online Portfolio Look Like? Portfolios can be different for each business or niche. For example, a website development agency would likely display the websites they’d made; whereas a real estate business would show their construction projects. The use of visual content in an engaging way can have more impact than plain, flat text. You can build an eye-catching portfolio by showing your best work first. With a WordPress website, you can use an image gallery or photo slider to present your portfolio. If you use an image gallery plugin, you can also add text accompanying the images to explain your work. The more presentable a portfolio you make, the more you’ll engage with your users. That said, let’s take a look at how you can build a beautiful online portfolio with WordPress. Now that you know why do you need an online portfolio, and what makes your portfolio look good, it’s time we walk you through each step of creating an online portfolio from scratch. Note: If you already have a website, then you can directly go to the 3rd step. If you’re just starting out, the first thing you’ll need is a domain name and web hosting. You can buy a domain from any of the top domain name registrars on the market. A simple domain name typically costs $11 / year. Next, you’ll find many web hosting companies with different offers. We recommend using Bluehost. It’s the most popular web hosting provider and an officially recommended WordPress hosting partner. For our users, they’re offering a free domain name and a massive discount on web hosting. It’ll save you a ton of money right off the bat when creating your online portfolio. WordPress is the world’s most popular website builder thanks to its great flexibility and features. It enables you to build an online portfolio exactly how you want to. After purchasing a domain name and web hosting, you’ll need to install WordPress. 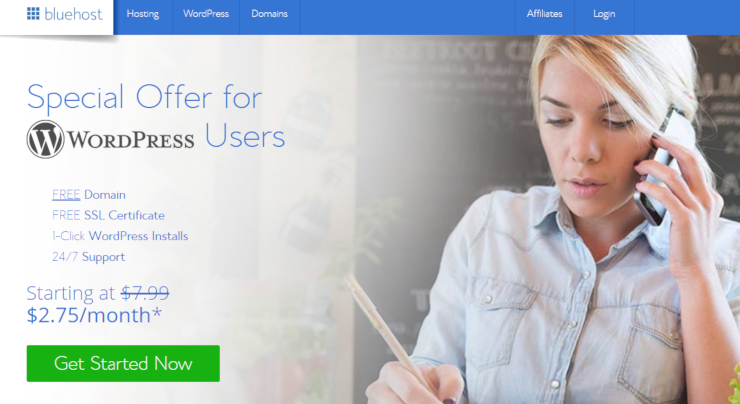 If you’re using Bluehost, then you can use their 1-click installer to install WordPress on your hosting account. Once installed, you can go ahead and make a website with WordPress. Next, you can take a look at the best WordPress themes and plugins to craft and customize your site. It’s very simple and doesn’t require any coding knowledge. 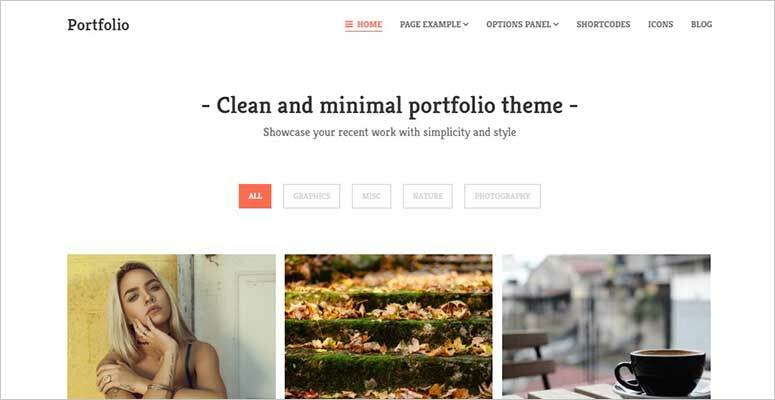 WordPress has a large collection of free and premium portfolio themes. You can find free themes on WordPress.org website. Simply search for the ‘portfolio’ term and it’ll display all the themes that can be used to make an online portfolio. You can also find hundreds of other themes/templates on the internet. For this guide, we’ll be using MyThemeShop’s Portfolio theme. 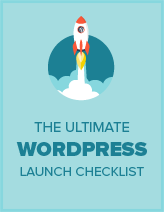 For more details, you should check out this article on how to install a WordPress theme. Once installed, you can select a layout. It offers 2 designs: blog portfolio and default portfolio. The default portfolio template shows your images on the home screen with big thumbnails. You can add the portfolio items from your WordPress admin backend. The theme allows you to add filters in the portfolio and organize your work to make browsing easy for your visitors. You can also select the number of columns to display the images. There’re many other useful features in the theme like resizing images, portfolio navigation, sidebar widgets, etc. You can make a powerful online portfolio to get attention from your potential clients. Not a fan of our example theme? No worries. You can use pretty much any WordPress portfolio theme to make your portfolio. The options and settings will be different for each theme, but you’ll still be able to get the desired result. While WordPress portfolio themes are solely focused on creating an online portfolio website, you can also use a multipurpose theme and then utilize plugins to add your portfolio into your web page. Simply check out our guide on how to add a portfolio to your WordPress site. 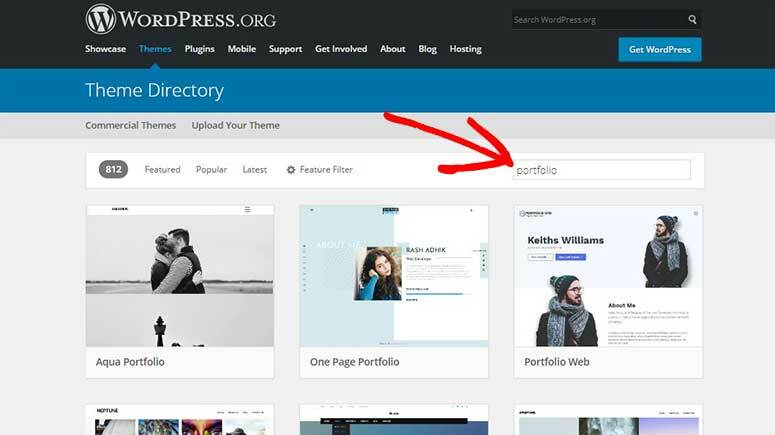 You can search for free portfolio plugins in the WordPress.org plugins repository. If you’d like to add premium features to your portfolio, then you can also find paid WordPress plugins on the internet. All of these plugins will have different features and options. You’ll need to do a little research and choose the perfect portfolio plugin to match your requirements. When your online portfolio is ready, you shouldn’t stop there. You’ll need to promote it, so more people can see your work. There’re many ways to do that, including email marketing, sharing on social media, and getting a word-of-mouth shoutout from the top influencers in your niche. You can also start a blog and share your experience in an engaging, professional way. You’ll also need to optimize your portfolio website or pages for the search engines. It’ll help you get more organic traffic. SEO will lead the right people to your portfolio who were actively searching for a similar type of work. Check out our complete guide on the best SEO tools to grow your website traffic. That’s all. We hope this guide helped you learn how to make an online portfolio with WordPress. You may also want to check out our article on how to use Google Optimize in WordPress.